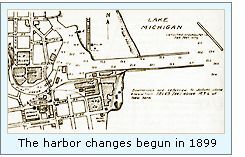 The first harbor improvements on Lake Michigan were undertaken at what was then known as Southport in 1844 with the erection of a pair of short timber piers on each side of the channel. With the elongation of these piers in 1856, a squat 12-foot tall timber-framed beacon was erected at the end of the north pier to serve as a guide to mariners seeking harbor entry. Outfitted with a Sixth Order Fresnel lens at a focal plane of 16 feet, the light was visible for a distance of 9 miles at sea in clear weather. The beacon was carried away in a violent storm in 1860, and with the country embroiled in the Civil War, funds were not authorized for its replacement until 1862, and a temporary light was shown from a post on the pier. With the end of the conflict in 1865, the Army Corps of Engineers was dispatched to Kenosha to begin the work of improving the harbor entrance through the refurbishment of the old timber piers and dredging the harbor to an increased depth of 16 feet. With the work progressing, the new beacon was finally reestablished on the end of the end of the north pier in 1867. The new structure consisted of a timber-framed pyramidal beacon standing 30 feet in height from its foundation to focal plane. With a focal plane of 39 feet, the fixed red Sixth Order Fresnel lens was visible for a distance of 12 miles. An elevated timber walkway lead from shore to a door in the service room, and allowed the keepers to access the light in relative safety when storms pushed waves across the surface of the pier. 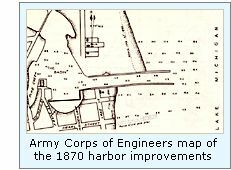 The Army Corps of Engineers continued their improvement work in the harbor, and by 1870 the north pier had been extended to a total length of 1,750 feet, with 800 feet of its length extending beyond the shoreline. With continuing extension of the piers over the following decade, with each extension, the beacon was picked up and relocated to the new pierhead. To this end, the beacon was moved 320 feet in 1875, 105 feet in 1880, and 100 feet in 1881, and 150 feet in both 1883 and 1884, with the elevated walk lengthened a commensurate distance with each move. Making her way between the piers during a storm on November 20, 1891, the schooner EVELYN ran into the beacon, damaging the watch room, with all of its contents carried off by the seas. A work crew was hired, and the damage quickly repaired. 1893 saw the erection of a lens lantern atop a post at the outer end of the north pier to serve as a front range 104 feet ahead of the beacon, and the following year this post was replaced by a 104-foot conduit was installed to allow the keeper to run the light to and from the end of the pier from the protection of the beacon watch room. The beacon was again damaged by a schooner of unrecorded name on November 25, and again repairs were quickly effected. While the numerous extensions to the piers helped solve the problem with sand build-up within the harbor, it was not as successful in eliminating the typical Lake Michigan harbor entry sand bar at the end of the piers, and thus constant dredging was required to keep the bar at bay. The cycle of constant wetting and drying, combined with winter freezes also continued to wreak their havoc on the timber piers. With the older sections of the piers showing signs of major deterioration, the end of the nineteenth century saw a cry rising in the local maritime community for the Federal government to undertake additional harbor improvements. 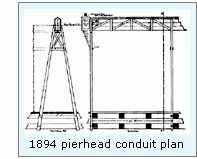 On March 3,1899, the Engineers modified the harbor project to including a widening of the channel, increasing its depth to 21 feet, and the erection of an angled breakwater designed to stem the flow of wave-born sand and thus minimize deposition in front of the piers. During a gale that November 1, the conduit was completely obliterated, and replaced by a post light 75 feet n front of the pierhead light five days later. With work progressing on the new breakwater in 1900, the decision was made to erect a light on the southeastern end of the breakwater to serve as a front range to the beacon on the north pier. While plans were in place for a permanent structure, funding was unavailable, and a temporary fixed red lens lantern was suspended from a brown iron pole until the necessary appropriation for a more substantial became available. 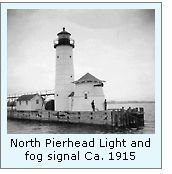 Protected by a v-shaped structure of 12-inch square 18-foot long timbers, the temporary breakwater light was placed into service on the night of October 26, 1900. With the harbor soon to be available to boats of the largest draft, plans were also underway to both establish a fog signal on the north pier and replace the old timber structure with a more durable cast iron structure. At the opening of the 1901 navigation season, a work crew and materials were delivered on the north pier, and set about enclosing the lower level of the beacon to serve as housing for a blower siren powered by a pair of 2-horsepower diesel engines, which were placed into operation on April 25. While on the pier, the crew also replaced the entire timber elevated walk with 1,040 feet of cast iron walkway. Materials for both the new breakwater light and north pier beacon were delivered to the Milwaukee storehouse by June 30, however, with the Army Corps of Engineers still working on the breakwater, and replacing the north pier with preformed concrete caissons, the erection of the new lights was postponed until harbor improvements were closer to completion. Materials for the two new structures were delivered to Kenosha in early 1906, and work began with the erection of the new pierhead light. Consisting of riveted cast iron rings, with each layer slightly smaller in diameter than the one immediately below, the tower tapered to a circular iron gallery on which a cylindrical lantern with diagonal astragals was centered. Capped by tapered conical roof, the structure stood 50 feet from its base to the top of the ventilator ball. The lantern was equipped with new flashing white Fourth Order Fresnel lens. Access to the tower from the iron elevated walkway was made through a door on the second deck level. Immediately in front of the tower, a wood framed rectangular pyramidal fog signal with horizontal wood clapboard siding was erected, and connected to the tower by a covered passageway with a door on one side through which entry to the fog signal could be gained. Work on the north pier was completed, and after the ironwork was given a fresh coat of white paint, the new Fourth Order lens exhibited for the first time on the night of May 24, 1901. The work crew then turned its attention to the breakwater beacon. Standing thirty five feet in height, the structure took the form of an octagonal center column with its lower section tapered outward to form a pyramidal service room sheathed in corrugated iron. A dormer on the east side of the service room housed a door with a pair of windows above to allow light into the interior. Integrated in the central octagonal column, the lantern was capped by a large copper-clad dome supported by sixteen corbels. Located at a focal plane of 37 feet, the 20 candlepower fixed red lens lantern was visible for 6 miles in clear weather. While the appearance of this light appears unique, there were four similar structures built during the same time period at Petoskey, Racine, Waukegan and Sheboygan. 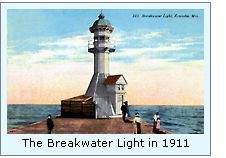 On July 27, 1912, the breakwater light was converted to acetylene power and the characteristic modified from fixed red to flashing white every three seconds. 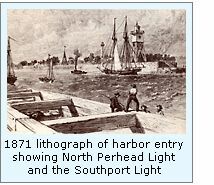 The following year, the lamp within the north pierhead light was also upgraded to an incandescent oil vapor lamp. The north pier light was given a coat of red paint in 1917, and the characteristic of the light changed back to red, only this time it was converted to an occulting characteristic of a 2.5 second flash followed by 12.5 seconds of darkness. 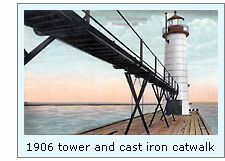 The 1906 breakwater light was removed from the breakwater in 1921, and replaced by a 37 foot tall red skeletal steel tower with its lower end enclosed, similar in design to that currently in existence on the Muskegon south breakwater. All lights were electrified in 1925, and the fog signal equipment upgraded to an air-operated diaphone powered by an Ingersoll-Rand air compressor. Three years later, the end of the south pier was marked with a steel pyramidal day mark, which was illuminated at night by a searchlight located on the pierhead. A some time during the 1960’s, both the breakwater and south pier lights were replaced by cylindrical D-9 towers, and while the 1906 north pierhead light still serves as an active aid to navigation, the fog signal building and elevated walk are long since gone, and the light is now displayed from a 250 mm Tidelands Signal optic. 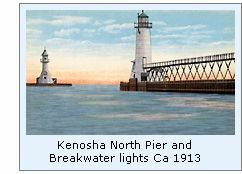 Click Here to see a complete listing of all Kenosha Pierhead Light keepers compiled by Phyllis L. Tag of Great Lakes Lighthouse Research. From I-94, head east on Hwy 158, which eventually becomes 52nd street as it crosses the City limits, to Sheridan Road. Turn left (North) on Sheridan Road to 50th Street, turn right (East) on 50th Street to Simmons Island Park. Bear to the right after crossing the bridge to the island, pass the Southport lighthouse on your left, and continue around the perimeter of the island to the parking lot at the foot of the pier. Personal observation at Kenosha, 09/08/2000.